You know when you just can’t help buying a planner you have no use for? Please note this post contains affiliate links. They are marked with a *. Yeah, that happened to me when I was picking up my Hobonichi Cousin from Amazon Japan. The Cactus Weeks that I’d kept looking at just happened to fall into my basket. I knew that if I really couldn’t find a use for it, I’d sell it on. But when it arrived it was so pretty I was determined to think of something. In the past year I’ve given more focus to my health and fitness. Ed and I started running in March of last year (though took a break from it when the heat got too much in the summer) and in October we started cutting down on the amount of meat we were eating. While I’ve been a steady weight for the past few years I’ve had a renewed desire to shift a bit of it. It was looking like a health planner might be the way forward with this Weeks. I’ve tried having a health planner before. A few years ago I repurposed a Happy Planner but it just had way too much space. I love the Weeks because it’s so compact yet you can get a lot out of the space. I didn’t think I’d have an issue getting this all set up and ready to help me hit my goals this year. First up, I needed tabs on the planner! These are the tabs from my shop. I’ve decided to keep this without a cover as it only lives on my desk and doesn’t go anywhere. I use a yellow Oli Clip* to allow me to quickly flick to my yearly overview pages. I wanted the Oli Clip to take me here as it’s a page I’ll be coming to daily. This is where I log my daily weight. I’ve kept it simple with just the title created using my label maker. I would like to develop this a little more and maybe have commentary at the start of each month (in the top boxes) on how the previous month went. These are probably my favourite in the whole planner. This is where I track all exercise. It’s colour coded by type of exercise. I simply highlight a line with the appropriate colour and then write the details for that exercise. Weight of each dumbell, length of run and in what time etc. It’s very satisfying to look at at the end of a month. I’m really happy with how January turned out! The last week Ed and I both got ill but other than that we got a lot of exercise in every week. I don’t count my steps on these pages but it’s something I’m debating adding. These pages are used for meal planning and I’m following a system I’ve used for a while now. First up I write the meals I normally make on page flags. I then attach the page flags to certain days according to whatever plans we have going on. Next I write the shopping list on the right hand side. Sometimes I start this list earlier in the week if I know there’s something like bin bags we’re going to run out of. Then I add in breakfasts and lunches and make sure I have all the ingredients to make those. If I don’t, they get added to the list. I’m not all that adventurous with my breakfasts and lunches but I haven’t got bored of them (yet!). I haven’t added much to these yet, but these are intended for recipes and anything else food related. The first thing that went in here was a list of breakfast places I found in an article. We’re always struggling to find a good breakfast place so this is a nice list to refer to on those times we want to go out. Where we have visited, I’ve written the date and given it a little rating. These Coco Fusen tabs* are perfect for highlighting pages I’d quickly want to flick to. This is the second of my three Hobonichi set up posts. You can see my set of the Cousin here, and my Everyday Carry Weeks here. 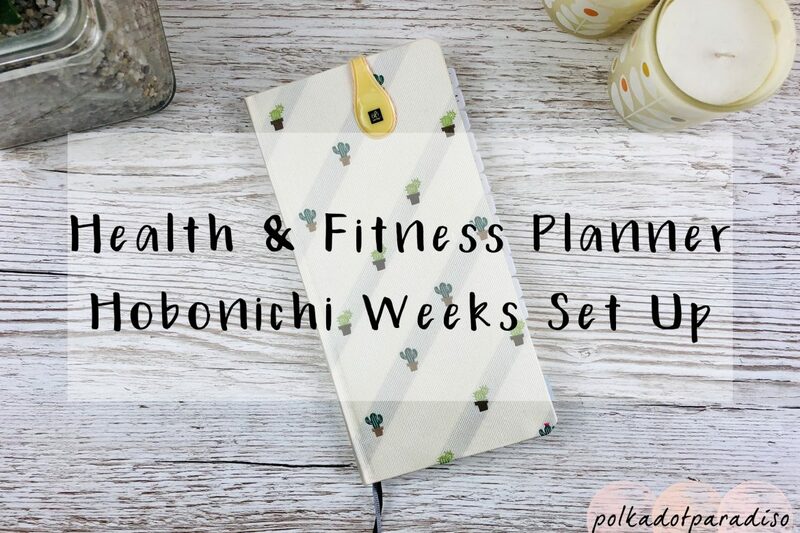 I’m really loving this little planner for health and fitness tracking. Having such a colourful monthly spread is keeping my motivated and the weekly pages of the Weeks are perfect for efficient meal planning. Do you have a health planner? I’d love to know what you use in the comments! If you’d like to purchase a Hobonichi, you can read my how to buy guide here.